Vegetable Oils are obtained from a variety of seeds, grains and nuts. Most common types of oil-bearing seeds and nuts are Canola, Castor, Coconut, Corn (Maize), Cottonseed, Mustard, Olive, Palm, Palm-Kernel, Peanut (Groundnut), Rapeseed, Safflower, Soybean, and Sunflower. Other major specialty oils are obtained from Almond, Avocado, Cashew, Grapeseed, Jatropha, Pecan, Pine, Shea, and Walnut. There are literally hundreds of other seeds and nuts that are available regionally around the world. Vegetable and Animal Oils and Fats have impurities such as Moisture, Solids (Insolubles), Gums (Lecithins), Free-Fatty Acids (FFA), Waxes, and Compounds of Sodium, Potassium, Magnesium, Calcium, and other metals. These impurities must be removed to improve the functionality of the oils. Other characteristics of oils (such as Color, odor, and taste) are also considered impurities by modern consumers. These impurities are removed in a series of steps such as degumming (to remove gums), neutralizing (to remove FFA), bleaching (to remove color), deodorizing (to remove odor and taste), and dewaxing or winterization (to remove waxes). 4. 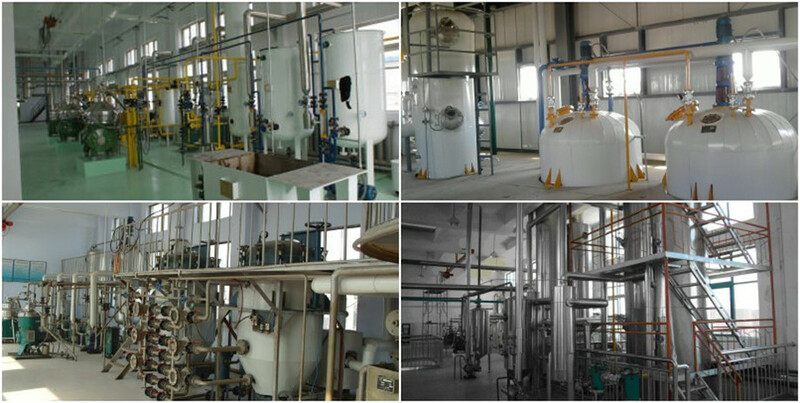 Deodorization: Deodorization is used to remove unacceptable odors by steam distillation, the odoriferous compound are stripped off with the help of live injected steam into heated oil under high LD pressure. 1. Decoloring tank: bleach pigments from oil. 2. Deodorizing tank: remove the un-favored smell from decolorized oil. 3. Oil furnace: provide enough heat for the refining sections which need high temperature of 280℃. 4. LD pump: provide high pressure for bleaching, deodorization which can reach 755mmHg or more. 5. Air compressor: dry the bleached clay after bleaching. 6. Filter press: filter the clay into the bleached oil. 7. Steam generator: generate steam distillation. 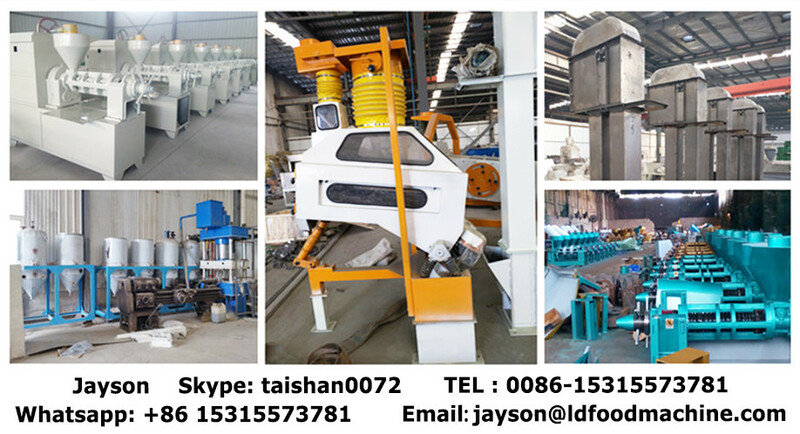 ZhengSkype： taishan0072 LD Indutech Machinery Co., ltd (hereafter referred to as "LD") is a joint-stock machinery manufacturing enterprise, integrating industrial scientific research, production and marketing. The company is located in the Industry Area Zone of ZhengSkype： taishan0072, China. The main products cover industrial drying machines,industrial crushing machines, mineral processing machines, brick machines, biomass energetic machines, environment protection equipment, food oil press machines and oil refinery plant Our key product include stone crusher,sand maker, stone washing machine, ball mill, flotation cell, AAC block plant, rotaty drying machines, biomass burner, coal gasifier, oil press machine, packaging machine, breeding machines, fertilizer and pellets machine and other machines. LD offer not only products with good quality and competitive price, but also top service and solution.